Our new Scent and Warmer of the Month is sure to be a hot seller. With pre-orders already selling huge numbers, don't wait to grab this special warmer for your home or office. 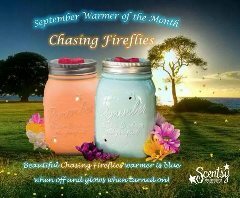 The Chasing Fireflies warmer is a reflection of younger days capturing fireflies and placing them in a mason jar. Ambrosia is a wonderful new fragrance sure to be a hit with those who love a more fruity and romantic scent. It's Scentsy's 10% off sale through August on selected items. Stock up on your favorites and don't forget to use our combine and save packages for your bars to save even more! Scentsy 10% OFF Sale (selected items)! Shop now!